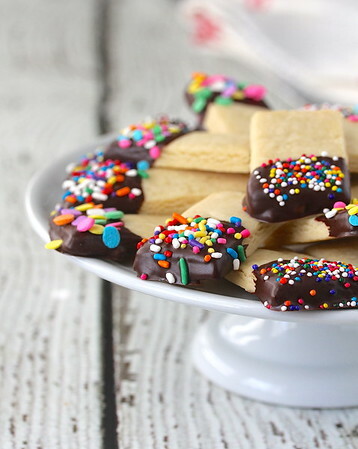 Aren't these Chocolate Sundae Shortbread Cookies the cutest? Everything about them says celebration. The Creative Cookie Exchange is baking cookies this month with the theme of ice cream. We were given carte blanche on the theme, in that our cookies did not actually have to have ice cream as an ingredient. In other words, the cookies just had to be in the spirit of ice cream! In the spirit of a chocolate sundae, I made these vanilla shortbread cookies. 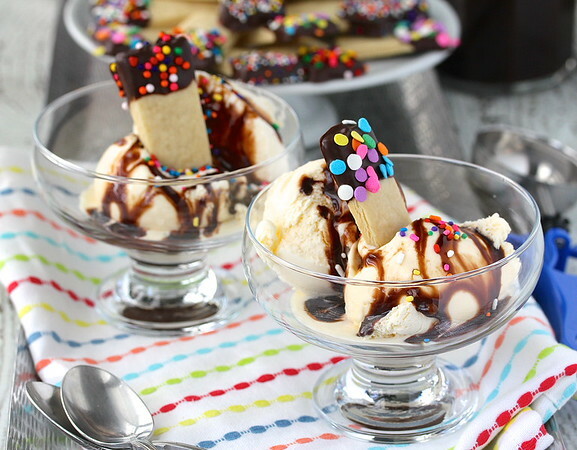 They are dipped in a dark chocolate coating and then doused in tons of sprinkles.... sort of a portable ice cream sundae, right? They are excellent dipped in ice cream, and are so whimsical! I am pretty sure sprinkles make everything better! For the chocolate coating, I used Dark Molding Chocolate from Surfas Culinary District. It contains tons of dark cocoa and tastes amazing. 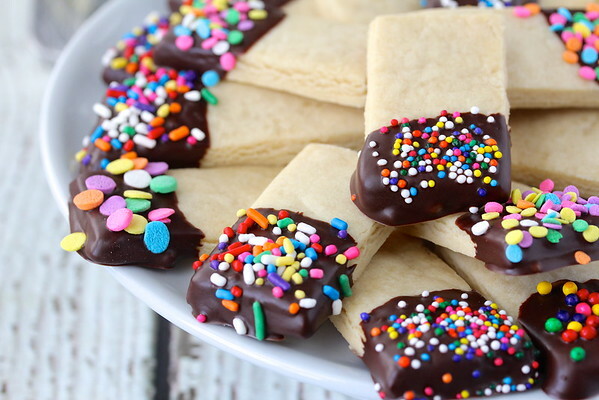 You can also use chocolate bark or candy melts. If you choose to use chocolate bars or chips, check out this coating recipe. After the recipe, check out all of the links from the Creative Cookie Exchange members' take on the theme of cookies and ice cream! In the bowl of a stand mixer, beat the butter until fluffy and light. Add the powdered sugar and beat until the mixture is pale and fluffy. Beat in the vanilla. Slowly add add the flour while mixing on low. If the mixture does not come together, add the water, by tablespoon, until you have a dough that is dry but cohesive. Roll the dough between two pieces of waxed paper to 1/4 inch thick. Slice the dough into 1 inch by 3 inch sticks and place the sticks onto a parchment lined half sheet baking pan (I used two quarter sheet pans). Gather up the scraps, re-roll, and continue to cut the dough into sticks. Cover and chill the cookies in the refrigerator while preheating the oven to 325 degrees F.
Bake the cookies for 12 to 15 minutes, until firm. Let the cookies cool on the baking sheet for ten minutes, and then cool completely on a rack. Melt your chocolate in a microwave, double boiler, or in a candy melts melting pot. Line baking sheets with wax paper. 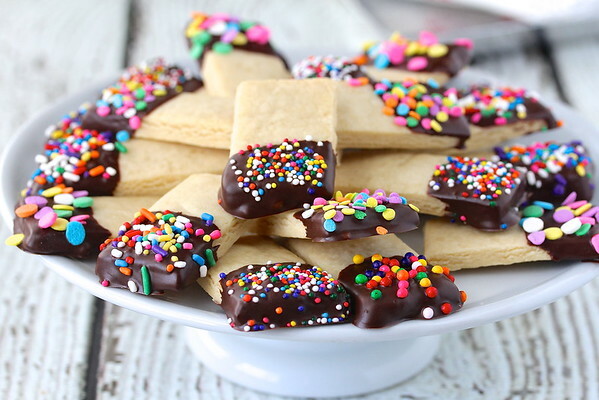 Dip the cookies into the chocolate, place them onto the wax paper, and sprinkle with jimmies, nonpareils, or other candy sprinkles. When chocolate hardens, store in an airtight container. Karen, how perfect with ice cream! I love the sprinkles, the perfect touch. These are so cute! And I agree - sprinkles makes everything better! My kids would go crazy for those! Adorable! I would not wait for the icecream to be served with those. My neighbors little kids would not leave my home I fi made them these. So I must. I love those guys! These look like fun for any ice cream party. My kids would probably love to help with this recipe. 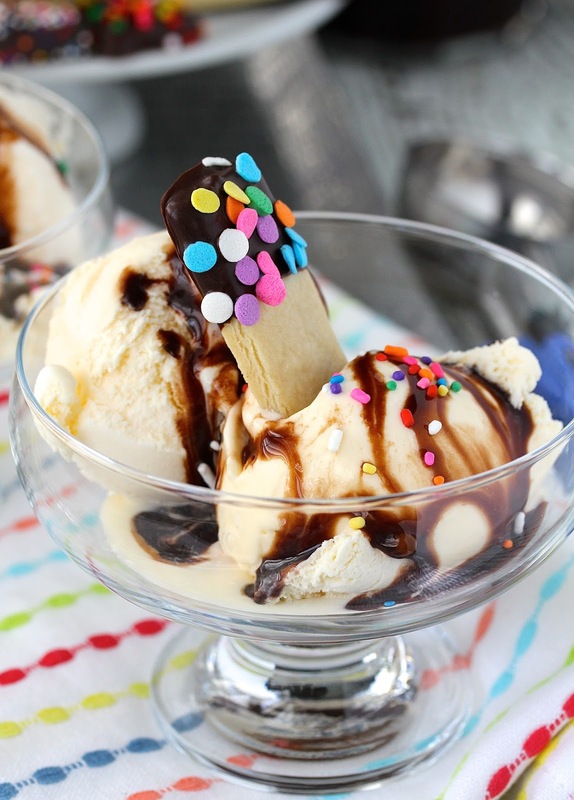 These look so fun and a perfect accompaniment to a bowl of ice cream. Finally a DAIRY FREE cookie for my grandson who has a deadly dairy allergy. I can use Earth Balance butter and dairy free chocolate chips. I'm pretty sure that the candy coating is dairy free too.